Why Did George Bush Buy Nearly 300,000 acres in Paraguay? 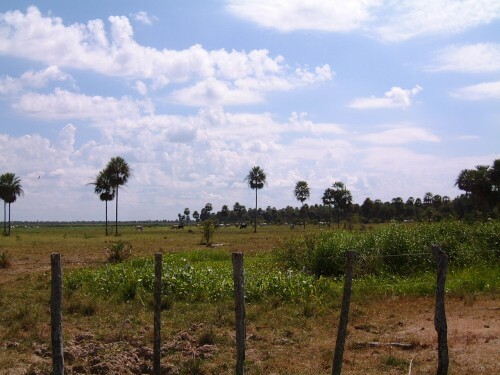 Haven’t you always dreamed of owning 298,840 acres of land in… Paraguay? We can see it now… strip malls in their dozens, tracts of identical houses from horizon to horizon, fleets of Buicks and Cadillacs doing 22 in a 30. Can’t you see the potential? This isn’t a new theme to 5 Min. Forecast readers. And like Jody, Jim sees liquid gold in them thar hills: “The entire water sector is poised for explosive growth.” Jim’s also got his eye on suitable investment opportunities in this space. To learn more about that, and a whole lot more, click here. The latest durable goods orders are out. And the results? Mezza mezz. Orders for durable U.S. goods jumped 4% in March, topping expectations for 0.6%. But the increase was driven largely by strong civilian aircraft, military hardware and auto orders. A little good, a little bad. Feel free to focus on whichever metric confirms your economic outlook. Stocks opened slightly higher today, buoyed mainly by a surge in the Nasdaq. The aforesaid index leapt deeper into record territory this morning, building on Thursday’s 5,057 close. The index hasn’t seen these levels in 15 years, in case you’re interested. Better-than-expected earnings from Amazon and Microsoft were the primary catalysts behind today’s jump. The other major indexes are treading water this morning. The S&P opened slightly higher, the Dow slightly lower. Meanwhile, gold is down $17, and oil is trading around $56.50, off a little over a dollar. No way, Jose, says Greg Guenthner over at our trading desk, answering this theoretical question: Is it time for you to pull the plug on the cheap oil trade? Oil spiked to $58 this week, as you’re doubtless aware. So what’s the best way to take advantage of continuing cheap oil, according to Mr. Guenthner? 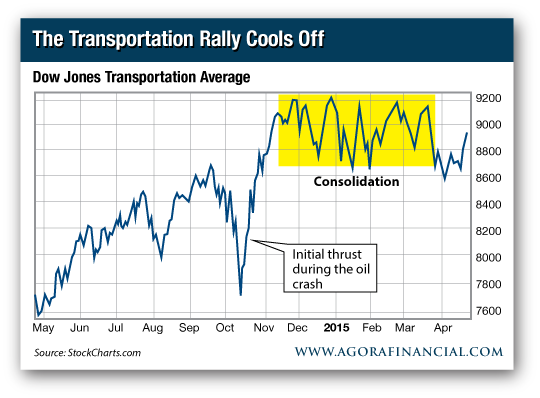 Transportation stocks. The secrets of an 18,000-bagger. 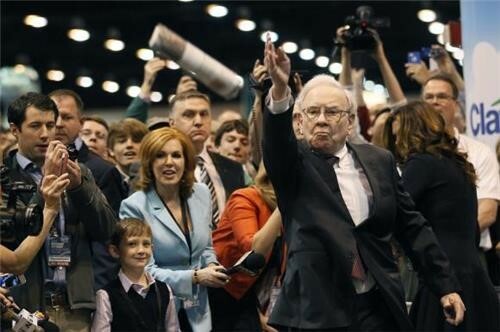 Our itinerant value guy Chris Mayer wings off to Omaha next week to join up to 50,000 souls for the annual Berkshire Hathaway confab. He’ll be getting the state of the union from the Sage of Omaha himself and his right-hand man, Charlie Munger. The thing is always a kick in the backside, a circus in a dozen rings. Where else can you watch Bill Gates play table tennis against a U.S. Olympian or win a Dairy Queen Dilly Bar for best newspaper throw? But Chris will be there for the business. He wants to study how Berkshire Hathaway pulled it all off. It staggers us to even think it, but if you invested $10,000 in Berkshire Hathaway in 1965 and never added a red cent, today you’d be sitting on — we hope you’re sitting down – about $180 million. Talking about buying right and holding on! Sounds like a plan. But Chris would be the first to tell you it takes more than that. He’s going at it hammer and tongs, though. And we’ll be keeping you updated on his ambitious 100-bagger project. “I was an NYSE and Nasdaq arbitrator for years… Based on the facts, Corzine should be sporting jailbird stripes in some prison yard. But oh, no… He walks the streets in his Guccis and has the cojones to talk of starting a new hedge fund… Only in America!!!!!!!! The 5: Looks like you got the spelling more or less right. The 5: That’s just how we roll ’round here. And asininity is in the eye of the beholder. Glad you find it all entertaining, though. “The Japanese marketers have it all backward.” That’s one reader’s take on one Japanese beer-maker’s marketing campaign targeting women. They added collagen to their beer to supposedly help skin complexion. That’s it. It’s been a pleasure. P.S. Dave will be back in the saddle on Monday to bring you another riveting issue.